It hasn't quite been a full week [it's barely been a weekend!] but I'm still claiming it as the end of Week One because today is Sunday and I just really love these diapers! 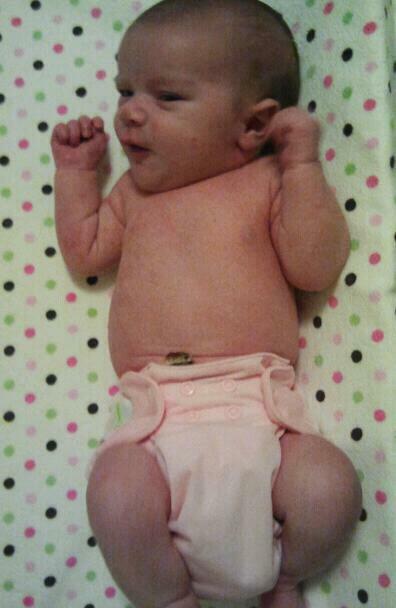 Happy Baby in her bumGenius AIO! 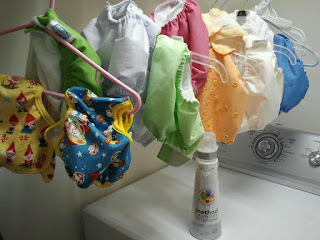 In my humble opinion, modern cloth diapering is practically the same as using disposable diapers when it comes to annoyances and inconveniences. The smells are the same, the hand washing happens just as often, and it's still poop and pee. The biggest difference between cloth and disposables for us comes down to money: instead of buying a $15-$20 pack of diapers each week (or more), we're tossing our diapers in the washing machine every other day. $15-$20 x 52 weeks = $780 - $1040 saved in a year. That figure doesn't even cover the wipes, diaper rash creams (cloth diapered babies don't get diaper rash), clothing replacements from blow outs, etc. 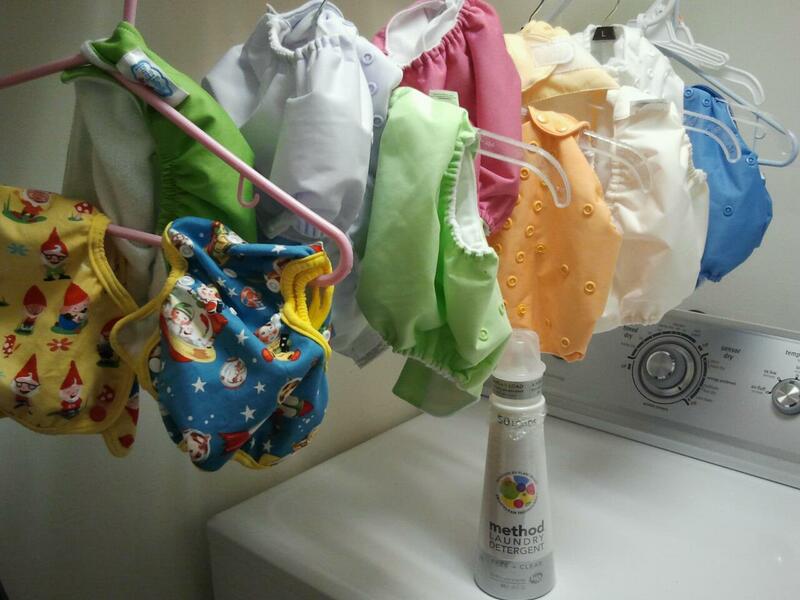 Cloth diapers also greatly reduce stinky garbage (or eliminate the need for a diaper genie). That also means fewer diapers will be rotting in landfills. In addition, I love the fact that we'll always have diapers in the house - no need for a midnight run to the store for more diapers! Our initial investment was $60 thanks to the generosity of our family and friends. The brand of cloth diaper we chose (bumGenius) is available at Target and Babys R Us so we were able to add diapers to our registry - this was a HUGE blessing! Each diaper ranges from $17 to $20, depending on the store and if there is a sale. For the cost of a pack of diapers, you can purchase a cloth diaper - They pay for themselves in a matter of weeks! If we paid for each diaper, it would have been a $300 investment for 15 diapers. We also purchased a wet/dry bag for our diaper bag when we change her on the go ($20) and two machine washable diaper pale liners that are water proof and do an excellent job of keeping the stink inside of the bag (around $20 each). We're also still buying disposable wipes with my couponing and they end up costing $1 or less for a 64 count box. The detergent we went with is Method Free and Clear. It's an inexpensive alternative for those diapering on a budget. If we were paying for everything out of pocket, it would be about a $400-$500 investment. We'll end up paying about $150 in one year when all is said and done. I plan on posting a breakdown of our accessories in my next weekly review. By the way, Abby's Lane is incredible! They have a great place in Olde Town Manassas as well as a wonderful online store with FREE SHIPPING. Whenever I'm near Manassas, I try to swing by to check out new products and learn more about diapering and other great things for Joanna (like baby slings, wraps, etc). All of this to say: I love cloth diapers!! I'm so thankful we're doing them! Big thanks to Lisa for getting me to look into them. It's the best choice we've made for Joanna next to leaving my job to stay home with her. Love this post and the fact that Cullen and Joanna wear the same size - snap setting wise in a BG diaper!